Cuir an adag leis a’ bhainne ann am pana trom air an stòbha air teas meadhanach. Teòthaich an adag gu socair mu 10 mionaidean, no gus am bi i bruich. Anns an eadar-àm geàrr an t-uinnean ann am pìosan beaga agus na leigeasan ann an sliseagan tana. Geàrr na peasraichean ann an striopan trastanach, agus sgrìob rùsg de dh’aon liomaid gu mìn. Nuair a bhios an adag deiseil, thoir am pana den teas. Thoir an adag às a’ bhainne agus cuir am bainne gu aon taobh. Nuair a bhios an adag beagan nas fhuaire, bris ann am bleideagan i, agus measgaich sùgh de dh’àon liomaid gu faiceallach a-steach dhi. Dòirt an ola ann am praidheapan mòr domhainn agus bruich a’ ghlasraich gu lèir gu socair fad 5 mionaidean. Cuir an rus rithe agus praidhig 3-4 mionaidean eile, a’ cur mun cuairt e gu cunbhalach. Dòirt am fìon ris agus teòthaich mionaid no dhà eile, an uairsin cuir an sùgh-circe no glasraich ris, beag air bheag, a’ cur mun cuairt fad na h-uine. A-nis tòisich ri gu leòr den bhainne a chur ris, beag air bheag, gus am bi an rus bruich. Measgaich an adag, an rùsg-liomaid sgrìobte, an sùgh den darna liomaid agus am piobar dubh a-steach. Sgeadaich le tomàto is peirsill agus gèinnean den treasamh liomaid. Cleachd rionnach smocte seach adag. Cleachd glasraich uaine sam bith eile, mar bhroccoli no ponair. Agus nì fìon dearg agus uinneanan dearg an gnothach cuideachd, mas e sin a tha agad ro làimh. Tha an leth-uiread ag obrachadh ceart gu leòr cuideachd. Put the haddie and the milk in heavy pan on the stove on a medium heat and simmer for about 10 mins or until the haddie is cooked. 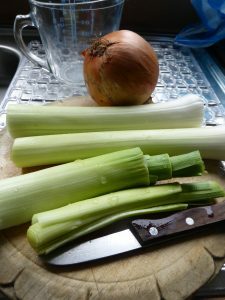 Meanwhile chop the onion and cut the leeks into thin slices. Cut the sugarsnap peas into diagonal slices, and finely grate the peel of one lemon. When the haddie is cooked, take the pan off the heat. 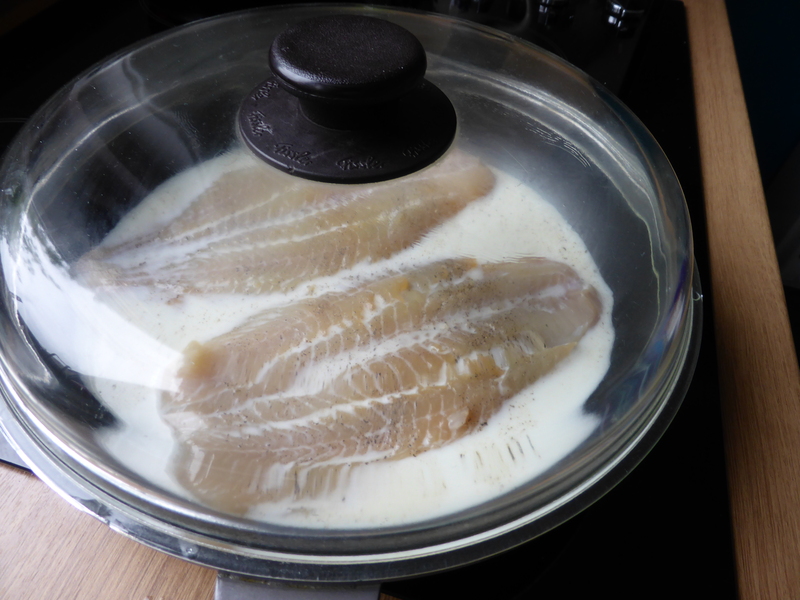 Remove the haddie from the milk and put the milk to one side. When the haddie is a bit cooler, break it into flakes and toss it carefully in the juice of one lemon. 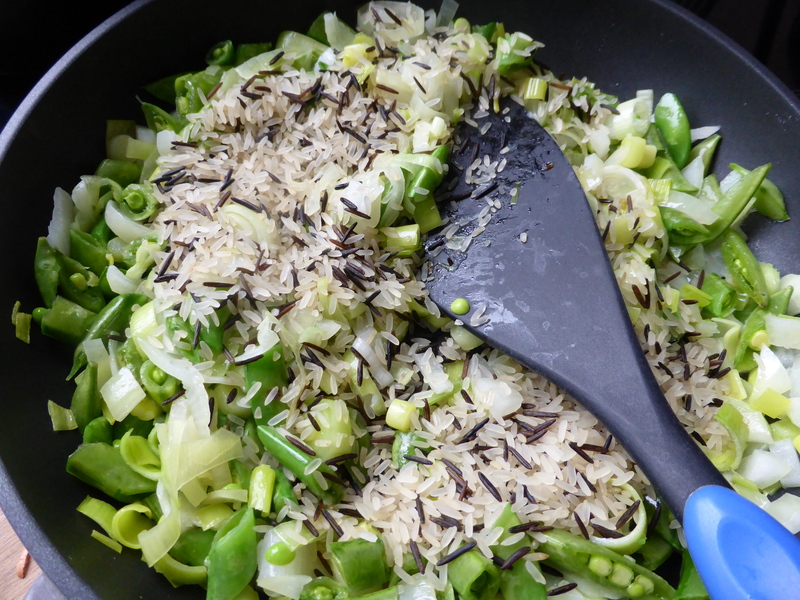 Pour the oil into a large deep frying-pan and cook all the veg gently for 5 minutes. 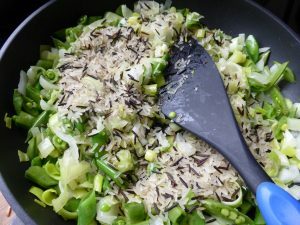 Add the rice and fry for another 3-4 minutes, stirring constantly. Pour in the white wine and simmer for a further minute or two, then add the chicken or veg stock, a little at a time, stirring all the time. Now begin to add the milk gradually, just enough until the rice is cooked. 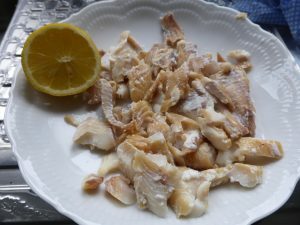 Mix in the haddie, the grated lemon zest, the juice of the second lemon and the black pepper, and serve. 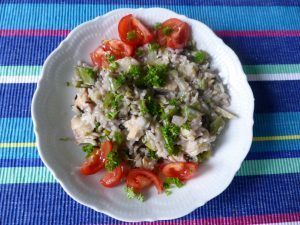 Garnish with tomato and parsley and wedges of the third lemon. Use smoked mackerel instead of haddie. 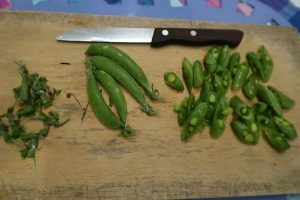 Use any other green veg, such as broccoli or beans. And red wine and red onions will also do the job if that’s what you have at hand. Half quantities also work fine.